Toshiba 46YL863 review | What Hi-Fi? Toshiba rounded-off 2011 with some of its best TVs in years, and the company has started 2012 in the same vein, with the 46YL863 getting a glowing five-star review recently. Toshiba rounded-off 2011 year with some of its best TVs in years, and the company has started 2012 in the same vein, with the 46YL863 getting a glowing five-star review in our March issue. Staggeringly priced considering that it still has features that befit a top-of-the-line set, it seems a steal on the face of it. 3cm deep and great for wall-mounting. it to one of the USB connections. The interface uses an intuitive new layout that makes it easy to navigate the huge amount of content and features at your disposal. You’ll even find a built-in test pattern for tweaking the finer details of your picture. Resolution+ aims to improve the sharpness and detail of standard-def content and we’re happy with the results in ‘auto’ mode, while Active Vision M800, Toshiba’s motion-processing tech, proves a little unnatural for us in ‘smooth’ mode but ‘standard’ does make things a little more stable. The standard selection of analogue and Freeview HD tuners is present and correct, the latter delivering a quality performance. Edges aren’t quite as robust as the very best, but vivid colours and decent detail ensure we’re happy with what we see. The HD channels ratchet up the quality a notch too, making for a solid off-air introduction. Switch to HD video and Toshiba’s new CEVO Engine picture processor fires up. It works with the new PRO-LED ‘hybrid’ local-dimming LED backlight, which combines both edge-lit and ‘direct’ backlighting to optimise contrast levels. This shows in scenes where the light delivers shadow, the Toshiba doing a good job of applying contrast. And it certainly makes for a punchy image, too, with bright colours set against deep black levels. Colours are painted in broader strokes here than on other sets, meaning you don’t quite get the same level of subtlety, but it’s a picture that commands attention with its bold hues. It’s worth noting its adeptness with standard-def DVD pictures, too, the picture processing doing a decent job of tidying up edges and presenting clean, detailed images. While fast action is largely confidently dealt with, there is on occasion the odd slip – this set’s grip isn’t quite as fast as some. But it’s a minor point that’s almost moot, like any little gripes we have with the 46YL863, when we remind ourselves of the price. of the 3D TV performance has moved forward, in line with rivals, to something that’s perfectly watchable. it’s still there and is presented in a calm manner, which is all right by us. to see what’s on offer. And, admittedly, what’s not: the selection is much smaller than its rivals here and doesn’t include Skype, Netflix or much catch-up TV – but there’s Acetrax for films, BBC iPlayer, Aupeo and iConcerts for music, Facebook and DLNA media streaming. quality video, with iPlayer displaying something approaching SD-quality. We’ve touched on it a few times in this review and we must close by circling once more, in the brightest red pen that we can find, the outlandishly low price. Staggeringly priced considering that it still has features that befit a top-of-the-line set, it seems a steal on the face of it. We see no reason why a TV shouldn’t look the part, too; a 46in TV, no matter how slender, is still going to take up a chunk ofspace. Thankfully the Toshiba delivers on that front, too – it’s just 3cm deep and great for wall-mounting. There are four HDMI connections, two USB inputs, integrated wi-fi plus an ethernet connection, digital audio and headphone outputs and many of the other usual suspects besides. It’s DLNA certified for multimedia streaming, too, and you can even turn an external HDD in to a PVR simply by connecting it to one of the USB connections. The interface uses an intuitive new layout that makes it easy to navigate the huge amount of content and features at your disposal. You’ll even find a built-in test pattern for tweaking the finer details of your picture. And you can connect the company's £200 TPA-1 kit, a USB-based calibrator that works in conjunction with the automated test-pattern process built into the sety, to configure the picture for you. Set it in action and the results prove decent enough. Resolution+ aims to improve the sharpness and detail of standard-def content and we’re happy with the results in ‘auto’ mode, while Active Vision M800, Toshiba’s motion-processing tech, proves a little unnatural for us in ‘smooth’ mode but ‘standard’ does make things a little more stable. The standard selection of analogue and Freeview HD tuners is present and correct, the latter delivering a quality performance. Edges aren’t quite as robust as the very best, but vivid colours and decent detail ensure we’re happy with what we see. The HD channels ratchet up the quality a notch too, making for a solid off-air introduction. This shows in scenes where the light delivers shadow, the Toshiba doing a good job of applying contrast. And it certainly makes for a punchy image, too, with bright colours set against deep black levels. Colours are painted in broader strokes here than on other sets, meaning you don’t quite get the same level of subtlety, but it’s a picture that commands attention with its bold hues. It’s worth noting its adeptness with standard-def DVD pictures, too, the picture processing doing a decent job of tidying up edges and presenting clean, detailed images. While fast action is largely confidently dealt with, there is on occasion the odd slip – this set’s grip isn’t quite as fast as some. But it’s a minor point that’s almost moot, like any little gripes we have with the 46YL863, when we remind ourselves of the price. While the 3D glasses – active-shutter and rechargeable via USB – seem ‘last-gen’ in style and size, the quality of the 3D TV performance has moved forward, in line with rivals, to something that’s perfectly watchable. 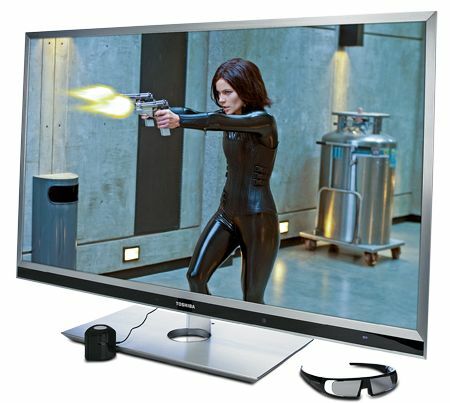 Toshiba has opted for a subtle but effective take on 3D, which makes for comfortable viewing. The sense of depth might be less dramatic than some but it’s still there and is presented in a calm manner, which is all right by us. Toshiba Places is the company’s Smart TV offering and very clever it is, too. There’s a ‘place’ for video, one or music, for social, and this order makes it easy to see what’s on offer. And, admittedly, what’s not: the selection is much smaller than its rivals here and doesn’t include Skype, Netflix or much catch-up TV – but there’s Acetrax for films, BBC iPlayer, Aupeo and iConcerts for music, Facebook and DLNA media streaming. And again, the Toshiba 46YL863 does a fine job of getting the best out of lower-quality video, with iPlayer displaying something approaching SD-quality. The 46YL863 is Toshiba’s flagship TV and does the position justice, yet it weighs in the best part of £1000 cheaper than rivals’ top dogs.